· The primary audience for this course are business intelligence professionals. · The secondary audiences for this course are technically proficient business users. · An awareness of key business priorities such as revenue, profitability, and financial accounting is desirable. Operational management of BI solutions is on the increase. An organization’s need for information, coupled with the timely delivery of this information, means that IT departments are placing as much emphasis on operational frameworks to support BI solutions, as they are on the development outcomes. With the development of BI solutions complete, the right processes and people should be in place to ensure that the solution delivers. You should also use supporting technologies to ensure smooth operations. Furthermore, developing a supporting logging and troubleshooting framework can aid the debugging and resolution of BI issues. The aforementioned are brought together within a single operational management framework that enables a cohesive and proactive approach to managing the BI solution in the production environment. It also ensures the continued operation of the solution, while providing a structured approach to solving BI issues. · Describe the rationale for BI operations. · Describe roles in BI operations. · Describe the technologies used in BI operations. · Describe environments and operational standards. The correct configuration of the BI components within the SQL Server product stack will have a big impact on the stability and performance of the overall BI solution. Configuring components by using best practice will enable the BI operations team to rule out the data platform as a root cause of issues that occur within the environment. Defining standards for server builds can help the effectiveness of the team to resolve issues in a known configured environment. Equally, understanding the type of architecture that a BI solution is implemented in will drive the standards for a given architecture. · Describe the importance of standardized builds. · Describe the configuration considerations for BI technologies. Managing the security of data within an organization should be the first priority for any operational team. Not only could the ramifications of a data leak lead to commercial losses, but there may also be legal and financial penalties that could have wider implications for the business. It is very important that the business intelligence (BI) operations team takes a holistic approach to securing the data. Considerations should include the physical security of the data, in addition to protection at an operating system or SQL Server level. Transfer of data to other sites and data at rest may have to be protected. In these cases, encryption components come into play. Meeting compliance requirements may force a business to track activity on SQL Servers, or provide access to data by using auditing. · Describe the security approach to a BI solution. · Understand the security components available. · Apply the security components to BI technologies. Deploying BI solutions is a discrete part of the BI development life cycle. The BI operations team will be called upon to support the development team during the deployment. The aim is to successfully create the solution within a production environment for operational use. The presence of nonproduction environments provides the opportunity to practice the deployments before they are conducted on a production server, so that the deployments can run smoothly. A variety of tools and practices can be used to aid deployments. Each method has its own benefits and can be used in any environment. Understanding the tools that are available and the benefits they offer will help you to pick the right tool for the job and aid deployment. · Application life cycle management for BI solutions. The main aim of any operations team is to ensure the continued service of key applications that are used within the business—more organizations are seeing a BI solution as a critical application for ensuring success. Therefore, the BI operations team should implement a proactive approach to overseeing the general health of the servers and services that are being used. This will involve employing a number of technologies that can log the operations of a service to proactively manage any potential problems that are identified. There will be times when the BI operations team will have to be reactive, using monitoring tools to help identify the root cause of any potential issues. · Describe the need for logging and monitoring. · Use various logging options. The task of trying to troubleshoot failed BI solutions can be complex. It requires an understanding of the environments in which the BI solution is hosted, and an understanding of the workloads that take place during the life cycle of the solution. Troubleshooting can be made easier if the BI operations team has established defined standards for different tiers of servers for the configuration, security, and deployment of the solution. Standards create a baseline environment for the servers and the solution so that the BI operations team have a clear understanding of the environment that they are troubleshooting. With this in place, when an issue is reported to the operations team, they can adopt a structured troubleshooting approach that means they can resolve the issue, and understand the root cause—this leads to a long-term fix. As these issues are occurring within live environments, it is prudent to follow a process that is in line with operational procedures, so that you set the expectations for resolving an issue. This will typically involve applying a fix that follows either standard operating procedures or emergency operating procedures. 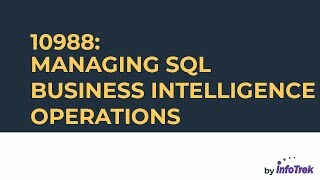 In this course, you have seen many of the operational activities that take place in an organization—they will often lead to the provision of a long-term solution to an issue that has been occurring in a BI environment. Sometimes, however, changes to resolve an issue that are made by the BI operations team, such as optimizing the BI platform, may not have the desired results. When the BI operations team are satisfied that they have exhausted all areas in attempting to resolve an issue, they might need to work with the development team to look at tuning the query aspects of the BI solution to improve performance. Many BI operations make extensive use of queries, and it might be necessary to look at these queries in more depth to improve performance. The BI operations team would also have to discuss taking advantage of BI component features to help in performance. For example, a suggestion might be made that Reporting Services snapshots could be used to help performance. However, the development team would need consulting to understand the impact of using such functionality on the overall solution. · Understand the need for performance tuning. · Describe the BI queries required to carry out performance tuning. · Use the tools for performance tuning. Gerald has 19 years of information technology experience and on community service and event experiences, he excels impressively. He was invited as a speaker for 3 break-out sessions for Microsoft TechED SEA 2008 on SQL Server 2008 at Kuala Lumpur Convention Center. He even participated at the “Ask-The-Expert" booth for Microsoft Visual Studio 2008 and Microsoft SQL Server 2008 at the Heroes Launch 2008 and conducted a Microsoft Visual Studio Team System 2008, formerly code-named “Orcas" Metro workshop for Microsoft Certified Partners and independent software vendors (ISVs). He was invited as a speaker on various occasions such as during the 2 break-out sessions and 3 instructor-led sessions at Microsoft TechED SEA 2007 on SQL Server 2008 and Office SharePoint Server 2007 respectively at Kuala Lumpur Convention Center. He was also a speaker for an instructor-led session at Microsoft TechEd SEA 2006 on development of web parts using Windows SharePoint Services Version 3.0 at Kuala Lumpur Convention Center. He conducted a few Microsoft Office 2007 Touchdown workshops for Microsoft Certified Partners and independent software vendors and Microsoft Windows Vista Beta 1 Touchdown workshop and Microsoft Windows Vista Beta 1 Touchdown workshop for Microsoft Certified Partners and ISVs. He also conducted a Microsoft Windows Server code-named “Longhorn" Touchdown workshop and Microsoft Visual Studio Team System workshop for Microsoft Certfied Partners and ISVs. He was invited as a guest speaker on Microsoft Office 2007 development for the MIND community, which is an active IT community under the helm of Microsoft. He is a committee member of SQL Practitioners Alliance Network (SPAN). He was the co- speaker and tag team presenter at the recently concluded World SharePoint Conference 2014 at Las Vegas, USA. He was the only Malaysian presenter among the other presenters from Asia. In March 2014, he participated as co-speaker and tag team presenter at the World SharePoint Conference 2014 at Venetian Hotel and Resorts, Las Vegas, USA. Recently, he conducted a specialized Microsoft SharePoint training and consultancy for a team of 17 people from Carlsberg Group at Carlsberg & Jacobsen Brewhouse in Copenhagen, Denmark.